So I thought I was sitting down to read a few pages or so, but then I got to read all the way till lunch! These boys just played and played and played. I got up every once in a while to check out a cool trick or creation or help with sharing, etc. 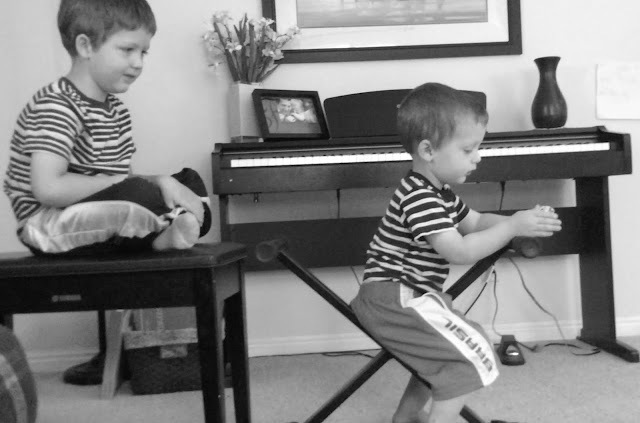 But Porter and Owen just had a fun morning -- an uno card game, dominos, houses made of books, a piano bench train (above), cars... I was so happily surprised at their happy play! I obviously love playing/working/reading with these kiddos, but it was fun for one day to stay in my pjs reading a good book through the morning too!